For 20 years this market has stood on the Mound, adding a particularly Germanic feel to the heart of Edinburgh’s landscape, and this year it stretches all the way along East Princes Street Gardens and towards St Andrew Square. Expect crafts, glühwein, German sausages, sweet things and more. The Mound and East Princes Street Gardens, Edinburgh, Fri 22 Nov–Sun 5 Jan.
Glasgow’s main Christmas market returns with a typically international feel, selling glühwein and German hot dogs alongside French crêpes, American burgers and the cross-border comfort of a nice hot chocolate, and with craft, jewellery and clothing stalls alongside cheese, chutneys and other produce. 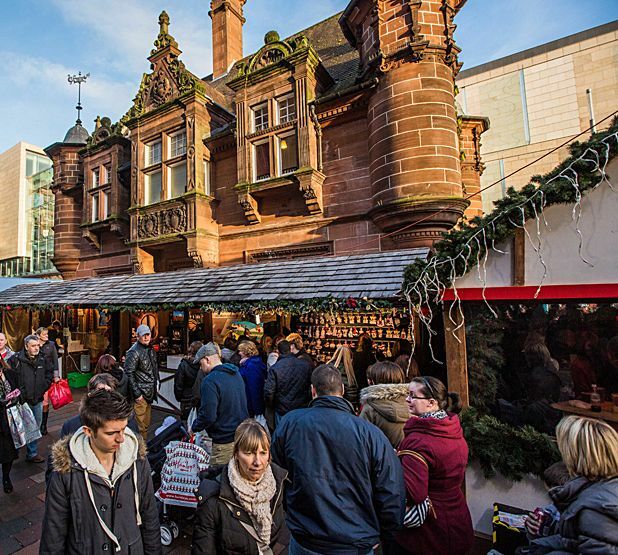 St Enoch Square, Glasgow, Sat 16 Nov–Mon 23 Dec.
New for this year are plenty of events and stalls in St Andrew Square, which is where you’ll find both of the above – one selling toys, the other offering fresh seafood, craft beers, butteries and fish ’n’ chips. St Andrew Square, Edinburgh, Fri 22 Nov–Sun 5 Jan.
Glasgow’s main farmers market specialises in seasonal meat, fruit, veg and street food, and as Christmas approaches the focus also turns towards festive favourites. Alternating Saturdays weekly between Queen’s Park and Mansfield Park, Sat 16 Nov–Sat 21 Dec, also Mon 23 Dec at Mansfield Park. Despite a bunch of new Edinburgh markets opening in areas like Cathedral Lane and Stockbridge, the one on Castle Terrace is the original and largest, featuring seasonal produce from some of best suppliers. Castle Terrace, Edinburgh, every Saturday 9am–2pm. Over 40 stalls of local produce, direct from the manufacturers, every second and fourth Saturday of the month. Enjoy the hustle and bustle of the Christmas market with German bratwurst, sweet treats and a sparkling array of gifts and decorations. The legendary Gluhwein House returns serving Gluhwein, Bavarian beers and mulled cider in festive flavours including Rocking Robin and Merry Mixed Berry. Get your fill of festive wooden toys, meaty sausages and hot drinks at this hive of twinkly festive market stalls in the heart of the city. Crafts, toys, unique, gifts, cards and other Christmassy delights are on sale, with a visit from Santa for the wee 'uns, live music and more. The traditional Christmas market spreads to George Street offering a unique, festive shopping experience for every visitor with its array of crafters, artists, gifts and tasty delights. "Edinburgh European Christmas Market - For 20 years this market has stood on the Mound"
Wrong, it's new this year as the councils greed extended into another area of public life. The council appointed new operators who increased fees to the German traders by 50%.